President Rodrigo Duterte of Philippines will be visiting Kuwait early March at the invitation of the Kuwaiti ruler to defuse the diplomatic tension, which emerged over Manila’s concerns about the situation of Filipino workers in the Gulf country. 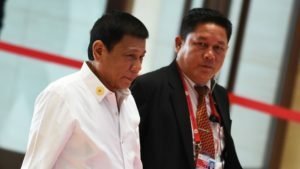 Duterte accepted Emir Sheikh-Sabah Al-Ahmad Al-Sabah’s invitation and the visit could take place during the first or second week of March, Kuwait Times reported, quoting the Kuwaiti deputy foreign minister Khaled Al-Jarallah. The meeting will be the first at the highest level between the two countries since President Dutert chided Kuwait for closing eyes on abuses that Filipino workers face in the Gulf country. The tension further escalated this month after the Filipino leader ordered the repatriation of his countrymen following the emergence of photographs showing a Filipina dead in a freezer in an apartment in Kuwait. Kuwait lambasted Manila’s move to repatriate its nationals saying that the decision was useless and was intended to strain relations between the two countries. Speaking to reporters following a session of the foreign relations panel of the National Assembly, Al-Jarallah noted that an agreement to regulate the affairs of Filipino workers in Kuwait will be signed during President Duterte’s trip. He said a committee composed of both countries has reviewed the agreement proposed by Manila. Manila in January imposed a ban on travels by Filipinos to the Gulf countries arguing that it was protecting its nationals from mistreatment and abuses. Kuwait rejected the accusation though acknowledging that there were few cases of abuse. Written by: KanelkaTagba on February 20, 2018. Posted by KanelkaTagba on Feb 20 2018. Filed under Gulf News, Headlines. You can follow any responses to this entry through the RSS 2.0. Both comments and pings are currently closed.